Since Katy Perry announced she was booked for the Super Bowl's halftime show, rumors have abounded about a special secret guest. Who would show? Some had it pegged at Perry's pal Rihanna, but logically that would never fly—badgal would most certainly hold out for her own damn Super Bowl halftime. 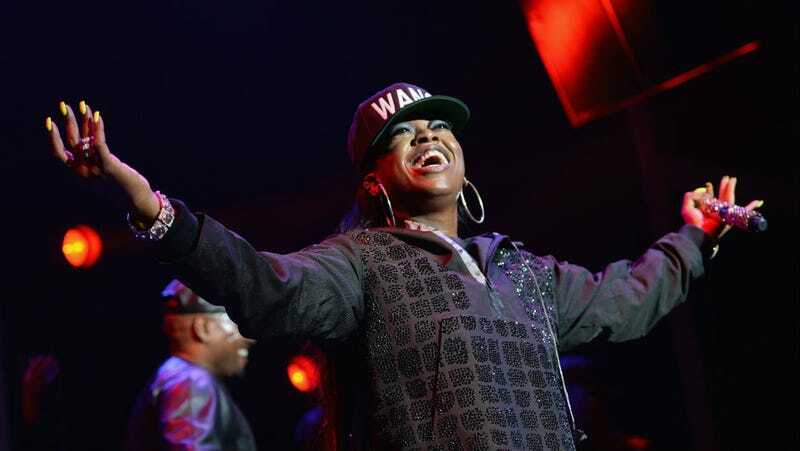 But now we know for sure: it's Missy Elliott, on her long-game resurgence ish. Yet another reason to watch the Super Bowl, which I know I've been sitting on my hands with excitement about. No, seriously. Missy Elliott is going to "Work It" at the Super Bowl with Katy Perry. A person familiar with the plans for Sunday's halftime show told The Associated Press on Thursday that Grammy winner Elliott is slated to make a surprise appearance during Perry's performance. The person spoke to the AP on condition of anonymity because Elliott's participation had not been announced by the NFL. Elliott was also recently the guest performer at Alexander Wang's blockbuster H&M line runway show, and has been developing her label, mainly focusing on Sharaya J. So she hasn't left music—she's just hasn't been in any Gap commercials lately. I wanted to bring someone back. A throwback of sorts that definitely needed some more shine. All I can say is it will be a real female fun night. It's a bit old school. When this person enters the stage and you hear the first ring of the chord I think jaws will drop and faces will melt. Gonna give Perry the benefit of the doubt but that is a somewhat condescending way to refer to one of the best rapper/singer/producer/style icons in history, especially about someone with whom you collaborated not four years ago. But also, she will be performing "Work It." If they wanted to get really female fun with it they'd perform "Pussycat," but then of course the NFL would sue them for tens of millions of dollars, so that's out. In lieu of that, let's listen to it now. See you Sunday, Missy!